Chuck Close, “Self Portrait (Pink T-shirt), 2013. Jacquard tapestry, 93 x 76”. “Roy,” 2011. Jacquard tapestry, 87 x 74″. Courtesy of the artist and Pace Gallery. Photo by Brian Buckley. 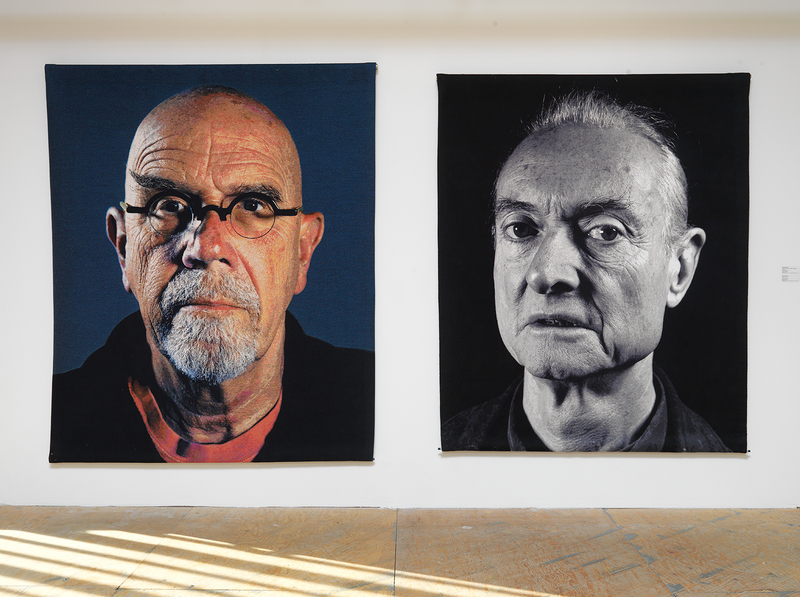 To appreciate the history behind the tapestries, one must trace what has remained the same throughout his career: the artist’s insistence that his work relies on the tenets of abstraction. During his graduate studies at Yale, Close focused on photo-based portraiture, rather than the abstract vocabulary popular at the time. As he put it, his interest was in exploring the “tension between reality and artificiality.” This was a concept explored by many artists, especially in that era, but most distanced themselves from representational approaches. Close did the exact opposite, and because of this choice, many have tried to fit him within the realist movements of late ’60s and early ’70s. Yet he has always dissociated his work from realist categorizations, emphasizing instead how theories of abstraction have influenced his work. Abstraction enters Close’s work through the algorithmic process. He speaks about it in an almost mechanical way, explaining in 2008, “I was as interested in the distribution of marks on a flat surface, as I was in what they stacked up to represent.” In each painting, the process is similar. The initial image is divided into a grid made up of cells, each perfectly executed. When placed together, the cells ultimately resolve themselves into a portrait. This algorithm frees the artist from his representational preoccupation while still allowing him to build something figurative. Close leaves the trace of his algorithmic process within the image, but the artist’s hand is still visible in the process of painting itself. In other words, in Close’s work the viewer’s desire for painting can be satisfied by the visual play of the brush. While the artist’s newer series of tapestries is an extension of this algorithmic process, it introduces a more radical removal from the act of painting. Instead of breaking down a picture into grids and circles of color that he paints with a brush, the artist now separates the images into individual threads. The tapestries are made in Belgium on Jacquard looms. Historically, tapestries were considered a luxury item because of the time and labor they required. Today, it is all done by machine: a computer translates the image into threads, and the mechanical looms recreate the image by weaving together thousands of multicolor threads. So while it seems like Close has stripped his work of all of the essential elements mentioned above—certainly the hand has been taken away—we see in the tapestries that the core of his artistic process remains: the grids and algorithmic process. Ironically, by taking away his own hand and relying on a loom and thread instead of a brush and paint, Close actually carries the logic of his process further towards abstraction.